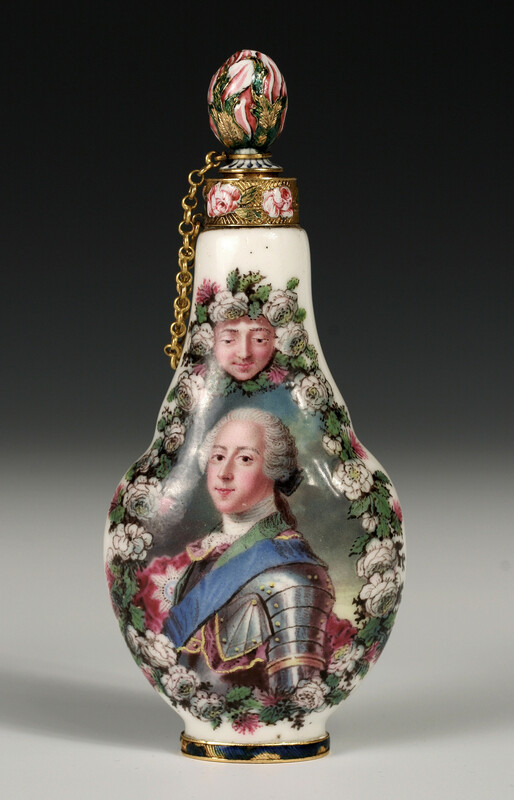 The bottle painted with a half-length portrait of Prince Charles Stuart, Bonnie Prince Charlie, in armour wearing the sash and star of the Garter and the green sash of the order of the Thistle. Probably painted by Giovanni Sigismondo Fischer after the painting by Maurice Quentin de La Tour. The reverse with the arms and motto JE N’OUBLIERAY JAMAIS. of Lady Mary Hervey, wife of Lord Hervey of Ickworth. Both side are framed in a floral garland beneath bacchic heads derived from the silver Tazza Farnese designed by Annibale Caracci, in the Capodimonte Palace collection; Bonnie Prince Charlie’s garland comprised of thistles and roses. The gold and enamel mounts are London work by an unidentified goldsmith. Carolla-Perrotti, Le Porcellane dei Borbone di Napoli, Capodimonte E Real Fabbrica Ferdinandea, 1986, n. 195, pl. 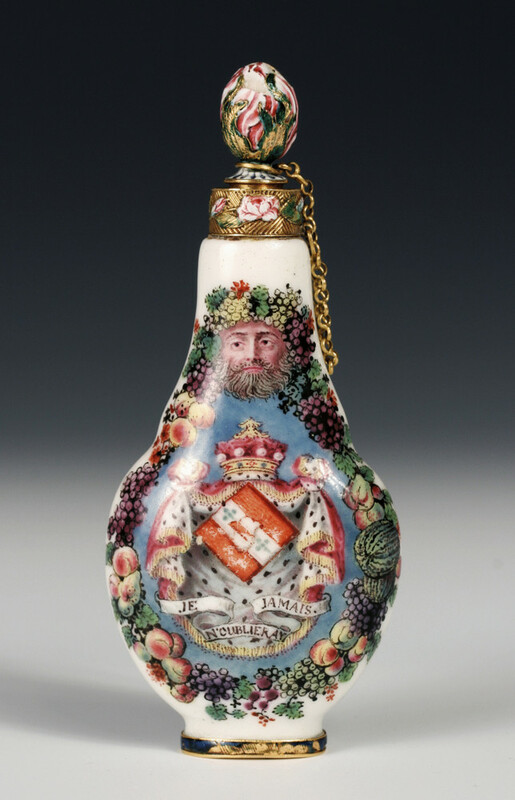 V. Two unpublished examples are in a Milanese private collection, and in Schloss Fasanerie, The Hessischen Hausstiftung. These three examples do not have the portrait of Bonnie Prince Charlie or the arms of Hervey. An example painted with military equestrian figures was sold, Sotheby’s, 13 July 1976, lot 96, this is perhaps the example now in a Milanese collection. Augustus Hervey’s Journal (The Adventures Afloat and Ashore of a Naval Casanova),1753 July, Edited by David Erskine, p. 146/147, where he describes buying ‘chinay’ and visiting the King’s Manufactory.